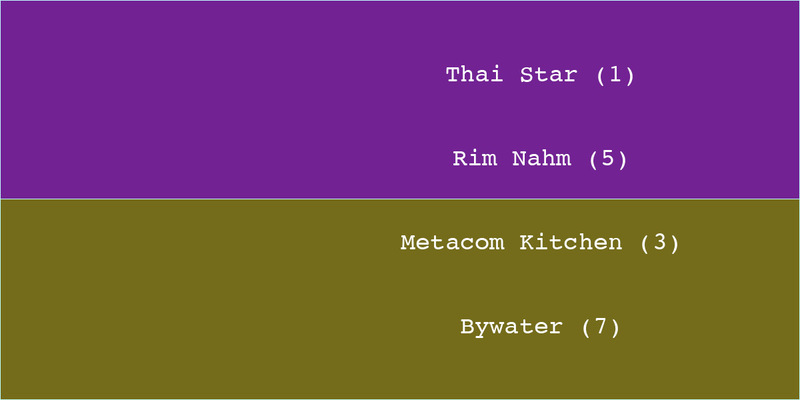 Metacom Kitchen had no trouble at all winning the Battle for Warren against Bywater. They maintained a healthy lead all through Saturday and wound up Sunday morning with 71% of the votes. You’ll see them next Sunday in the Sweet 16. They’ll go on to face the winner of the Eli’s/Slow Rhode Match. Rim Nahm came out early in the Thai-on-Thai match against Thai Star, but midway through the afternoon Thai Star tied – try saying that ten times fast – which eventually led to a big 4-1 victory. On Sunday they’ll face either thailand or 10 Rocks.